Rainbow Six Siege has traditionally been about pint-point accuracy and attentive, snappy reactions. Operation Para Bellum – the latest content update for Ubisoft’s tactical shooter – doesn’t change that, but it does offer a new layer to it all: false intelligence and counter-surveillance. New defender Alibi is all about mind-games, and she opens up a new series of tactics for players who aren’t the greatest shot in town. Alibi’s signature gadget is the Prisma; a projector that creates a holographic replica of Alibi herself. Three of these can be deployed, and dropping them in the right spot can be a real boon to a defending team. The hologram stands completely still – legs apart and gun aimed straight – and while that may look like an obvious fake to the defenders who have watched it be deployed, it represents a clear threat to an attacker who has only a split second to make a judgement call. Check out the full details of all the changes coming in Rainbow Six Siege Operation Para Bellum. It is thus important to set a Prisma hologram up in a location where an attacker won’t be able to instantly realise that it is a decoy. Peeking out from behind cover is an ideal example, or in an area with a short line of sight so an attacker coming around a corner will instinctively open fire. During my hands-on an enemy Alibi filled a room with all three of them and then hid in plain sight, forcing me to shoot out all the holograms to reveal who the real Alibi was, and effectively recreating her teaser trailer. Naturally I was dead before the final hologram was shot. When playing as Alibi it’s important to place the Prisma in areas where it’s guaranteed to be shot at, because every bullet a hologram takes provides intelligence for Alibi. An attacker who shoots a decoy is tagged and revealed to Alibi, much like how Jackal’s tracking system works. For a few seconds the tag provides constant location updates, allowing you to quickly circle around the attacker and take them out from behind. This means that Alibi doesn’t demand quite the twitch shooter skills that most Rainbow operators do; if you can outsmart the enemy team, chances are you can get the drop on them. The Prisma itself has been designed to have synergy with the arsenals of other operators. For example, you can stack a hologram with a series of other traps to entice an enemy into a deadly situation. Drop a bullet-proof shield in a doorway, throw down a Prisma, and then set up a Frost trap. An attacker will likely mistake the hologram to be an enemy, but after discovering it’s a hologram they may be lured into a false sense of security and vault the shield, landing right in the Frost trap. If Alibi is all about confusion and spreading false intelligence, then Maestro – her Italian partner and second defending operator in the Para Bellum package – is all about gathering information and careful surveillance. He’s an exceptional anchor thanks to two key items: his LMG and and Evil Eye camera. Maestro carries two Evil Eyes, which can be affixed to pretty much any surface akin to Jager’s ADS devices. When locked in place they offer exceptional vision over an area, and can see clearly through smoke cover. They’re resilient; impervious to gunfire, merely temporarily deactivated by a Thatcher grenade, and vulnerable only to explosives or Sledge’s hammer. Adding two almost indestructible cameras to the CCTV network means Maestro can have an outstanding overview of the map and be informed of the attacker’s moves in advance. The Evil Eye is more than just a bullet-proof camera, though; it’s also a turret. When viewing the camera with Maestro’s phone, you can right click to open the shutters and deploy a laser blast. This gadget isn’t a cheap kill; the beam does just five damage per shot, and so is more of a hinderance and distraction tool than a second weapon, akin to Twitch’s drone. Be warned, though: when the shutters are open to reveal the laser, the camera is vulnerable, and a single bullet will destroy it. The laser also builds up heat, and firing it multiple times in a row will cause it to break down and require time to cool off. For all its strengths, the Evil Eye has been balanced out by fair drawbacks. While these cameras sound like Maestro’s secret weapon, it’s actually his weapon that brings the biggest change to the defense tactics. He can equip the ALDA 5.52; a chunky 80-round belt-fed monster of an LMG that can be mounted with an ACOG sight. This is a huge deal for defenders; never before have they had access to a light machine gun, and it opens up the opportunity to use some brute-force entry denial tactics. When anchoring a room, Maestro can simply hold down the trigger and spray round after round at the entrance to the site in order to force an attacker to hold back or find a different angle. 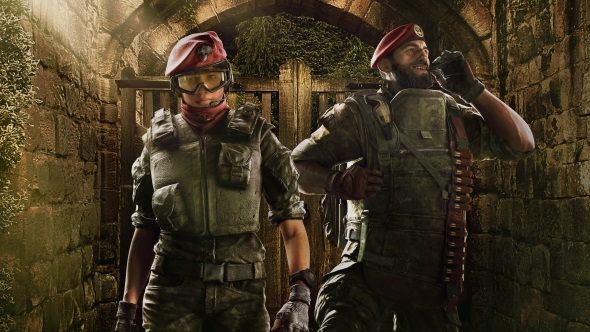 Both Alibi and Maestro also have access to some of Rainbow Six’s most terrifying weapons yet; the ACS12 and Bailiff 410. The former is a 30-round drum magazine-fed automatic shotgun that can reduce a wall to splinters in a couple of seconds, while the later is a 5-round shotgun revolver that’s great for blowing open peek holes and hatches. These tactics work well on Villa, the new map that ships with Para Bellum, thanks to a huge amount of soft cover and destructible floors. The four bomb sites have been designed for highly competitive play, with effective routes drawn between sites that provide opportunities for easy rotation. 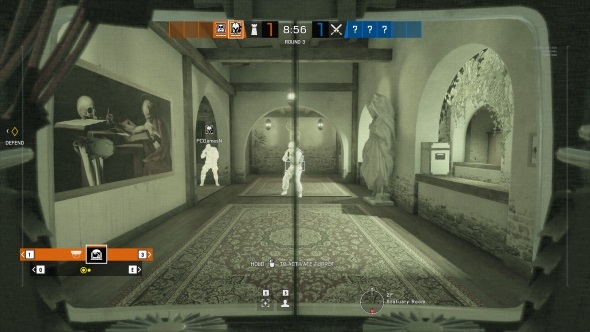 With so many of the walls being destructible, you can open up lengthy sight lines across the Villa’s floors, or keep it tight and windy in order to trap attackers and confuse them with Alibi’s decoys. While the map appears to be fairly balanced, it seems to be a touch more friendly to the defenders. On attack there are only a few entrances to the building itself, and many are precarious; a corridor into the wine cellar is narrow, and the basement itself is very claustrophobic, resulting in the perfect spot to create ambushes with Alibi’s holograms. If inserting from the roof, the only way in is through a skylight reminiscent of those on Kafe. The descent takes you straight through the Villa’s more open-plan second floor landing area, leaving you almost entirely exposed. Most of the windows are shuttered up, and thus many routes in are through more obvious doorways. Attackers will certainly need to be on their toes through all stages of the push. 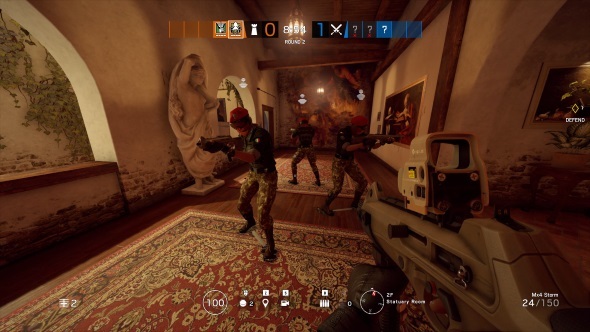 Para Bellum feels simultaneously like Siege’s most traditional and experimental update. The map feels designed to appeal to the game’s core PvP DNA; it’s just the right size and shape, with a great mix of sightlines and a layout that feels easier to navigate and learn that the likes of Tower. The numerous wooden surfaces splinter with ease, allowing more frequent vertical engagement opportunities via firing through floors and ceilings. But this traditional, well-rounded map is joined by some of the most interesting defenders to date. Alibi and Maestro offer new and exciting ways to play; defenders that can opt for a brutal full-force methodology, or more considered tactics involving psychological warfare and careful surveillance. While it’s difficult to predict exactly how players will make use of them and how they’ll shape the meta, one thing is certain: these new defenders will shake things up, one way or another. My bets are on Maestro being the longer-term favourite thanks to his LMG being an effective area denial tool, but I’m fascinated to see if Alibi’s Prismas can become a permanent fooling tactic, or if the entire playerbase will become wise to them in a short few months.